Enjoy unlimited access to over one hundred great Xbox One and Xbox 360 titles, including fan-favorites like Halo 5: Guardians, Payday 2, NBA 2K16, and LEGO Batman. With so many games to download and discover, your Xbox experience will never be the same. Download games directly to your console and play online or offline in full-fidelity, without any streaming or connectivity issues. Xbox Game Pass is a new gaming subscription service from Xbox. 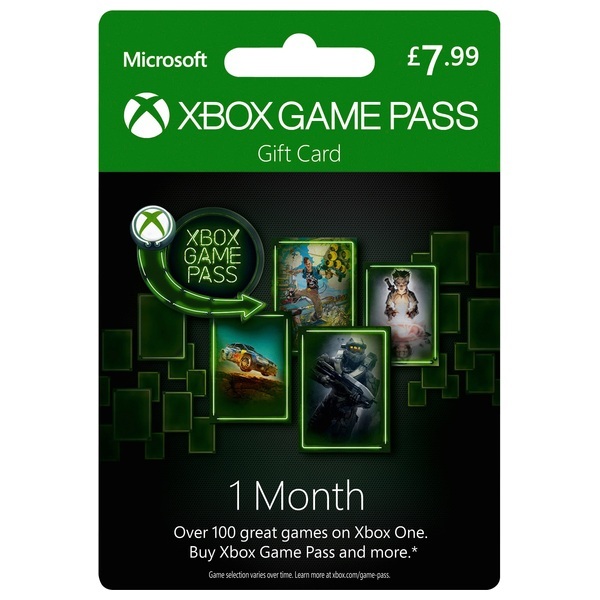 Xbox Game Pass gives you unlimited access to over 100 Xbox One and backward compatible Xbox 360 games – all for one low monthly price of €9.99 / £7.99 per month. Drop in and drop out— You can cancel any time. Even better, you can re-join any time and pick up where you left off in any game, progress intact. Unlike other comparable streaming services, with Xbox Game Pass you can discover and download full games directly to your Xbox One. This means continuous, full-fidelity gameplay without having to worry about streaming, bandwidth or connectivity issues. All Xbox One games in the catalog – and related add-ons – will be available to purchase at a 20% exclusive discount for Xbox Game Pass members. Every month 7 new games will cycle into the catalog giving you a constantly-updating library of games. Some titles may cycling out, but fans will get a month’s notice beforehand. Xbox Game Pass features great games from top idustry publishers such as 2K, 505 Games, BANDAI NAMCO Entertainment, Capcom, Codemasters, Deep Silver, Focus Home Interactive, SEGA, SNK CORPORATION, THQ Nordic GmbH, Warner Bros. Interactive Entertainment and Microsoft Studios, there’s something for everyone to enjoy and you will always find something exciting to play across a variety of genres. Minecraft now available on Game Pass, joining over 100 great games.